At Marin Sanitary Service, our commitment to finding the highest and best use of our collected material is never ending. In 2014, in partnership with the Central Marin Sanitation Agency, we launched the Food 2 Energy program (F2E) to convert every banana peel, stale loaf of bread, and meat trimming into a renewable energy source right here in Marin County. The primary goal of the program is diversion of organic food waste from the landfill and into the energy grid. The F2E program is a first for Marin County and is one of only two programs of its kind in California. The program takes food waste from participating local restaurants and grocery stores and converts the material into a bio-gas through anaerobic digestion. Anaerobic digestion is a process that converts organic material into a methane gas. That methane gas is then utilized as a power source for the Central Marin Sanitation Agency and helps power the operation of their sewage treatment facility allowing them to pump water, run filters, and clean Marin’s waste water before it goes into the bay. Another benefit of the conversion process is the avoided methane emissions at Redwood Landfill from the decomposition of organic materials and the reduction of truck trips from San Rafael to Novato. WHAT BUSINESSES QUALIFY FOR F2E? Food 2 Energy is a program specifically for commercial businesses that are large food waste generators such as restaurants, assisted living facilities, grocery stores, schools, hospitals, and any other business or institutional facility that has food service. In our service areas, there are approximately 250 large food waste generators who produce nearly 15 tons of food waste per day. When you set up service with us, an outreach coordinator will review these options with you to assess your qualifications for this program. You may end up as both a compostables customer and enrolled in our Food 2 Energy program, if that makes sense for your business. Greenhouse Gas Reduction – When food waste is sent to the landfill, it undergoes a type of decomposition without oxygen. This process creates an abundant amount of methane gas that is 21 times more harmful than carbon dioxide, which seeps into the atmosphere. The F2E program captures that methane and transforms it into a less harmful carbon dioxide gas. Save Money – The F2E program’s rate is greatly decreased from the garbage rate. We encourage participants to reduce their garbage service after enrolling in F2E reduces their overall bill. 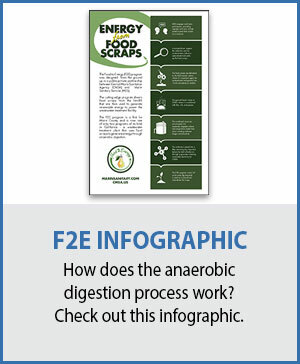 Advertising – Participants will receive program window decals and will be able to use the F2E logo on print materials and on their website to assure customers that they support Zero Waste. Landfill Diversion – In a 2014 study, MSS found that around 30% of all material is sent to Redwood Landfill is food waste. Diverting the food waste reduces the amount of solid waste sent there, which increases the longevity of the site. Since starting the program in 2014 we’ve enrolled 196 restaurants, cafeterias, and grocery stores. To date, 6,300 tons of food scraps have been diverted from the landfill and avoided 5,533 metric tons of carbon dioxide from being released into the atmosphere. This is equivalent to removing 14,335 cars from the road! If you think your business might qualify, or you have questions about the prgram, we’re here to help. Call (415) 456-2601 and a customer support representative will assist you. You may also email a Food to Energy Coordinator.